Overland Park, Kan. – July 9, 2018 – MSE Audio, parent company of SoundTube Entertainment, Soundsphere, dARTS, Phase Technology, Induction Dynamics, SolidDrive and Rockustics, announces the temporary move of manufacturing for Soundsphere following a structure fire at their Stratford, Connecticut facility. MSE Audio will transfer Soundsphere manufacturing to Jacksonville, Florida with plans for the facility to be fully operational within the next 8-12 weeks. MSE Audio’s Soundsphere facility is deemed a complete loss following an early morning fire on July 9, 2018. 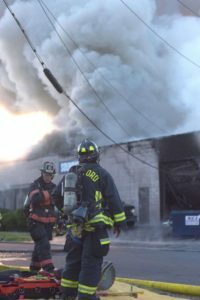 The 12,500-square-foot building broke out in flames around 6:30 am local time and 23 firefighters responded to the scene, with an additional 27 firefighters from Milford and Bridgeport being called in to help. As of 9:15 am ET, all firefighters have been accounted for and no injuries were reported. A cause has not yet been determined. It is due to this fire, MSE Audio will be immediately picking up Soundsphere manufacturing to an existing Jacksonville, Florida facility until situations normalize. MSE Audio plans for the facility to be up-and-running manufacturing Soundsphere within the next 8-12 weeks. In the meantime, MSE Audio is committed to providing dealers with the products they need from limited inventory across the country or can recommend a similar product for the dealer’s application from SoundTube Entertainment, a complimentary product line to Soundsphere. “We are absolutely devastated by the loss of our Soundsphere headquarters but we’re happy to report that no one was injured,” said Laura Waldon, President for MSE Audio. “We’re thankful for the timely response of our first-responders who battled the fire throughout the early morning hours. We want our dealers to know that we’re working quickly to rebuild the Soundsphere manufacturing and product stock, but in the meantime, we’ll do all we can to ensure our dealers have the product they need to complete their jobs on time.